After a hard day of porchin’ it, Jess and I met met up with my old friend Rachel Costa and her husband Jamal, who I was meeting for the first time. Rachel and I go way back to the days of dusk-till-dawn DIY P-town discotheques, and the last time I had a chance to see her was at a wedding in Sebastopol several years ago. It was really a surprise when I received the email from her letting me know that her and Jamal had bought a house together in Portland that they were fixing up. We decided to meet at Tube, a thin but lengthy bar in Portland that’s supposed to imitate the feeling of a television’s interior — except it’s the interior of a TV that has a heavy metal DJ, whiskey, and demon-rabbit art lining the walls. 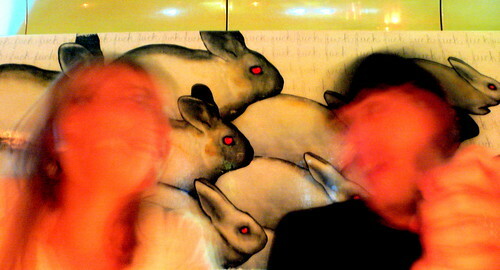 That’s Rachel and Jamal in the photo above, blurred out in front of the demon-rabbits. Here’s a shot of the entrance to Tube, with Jess standing outside in the “real world.” Did I mention that Portland has a deep metal underground? And it plows a dark and rich loam. Sadly, I ended up missing Celtic Frost’s Portland stop by just a few days. 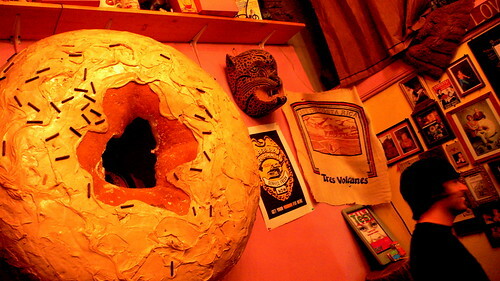 Here’s a shot of the interior of Portland’s Voodoo Doughnuts, which is open “22 hours a day.” Voodoo Doughnuts is known for their insane original doughnut flavors, including, apparently, a bacon-flavored doughnut. There’s also the Dirt, the Triple Chocolate Penetration, the Voodoo Doughnut (shaped like a voodoo doll), and even a vegan doughnut. After a few whiskeys, there’s nothing more flavorful and wonderful than a fresh doughnut. Nothing! Mine had some chocolate and some nuts on the chocolate and was quite satisfying and delicious. This was the nice lady who sold us our doughnuts. 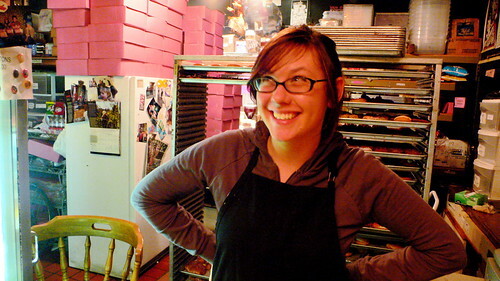 At 2:00 in the morning the place was packed and she was also selling donuts to hip-hoppers, reggae kids, stoned-out metalheads, and a selection of Portland’s (unfortunately large) population of meth heads. 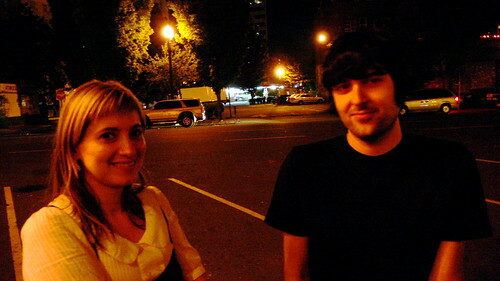 Here’s Rachel and Jamal outside of the Voodoo as we say our fond farewells. Good-night Rachel and Jamal! Good night Voodoo Donuts! Good night Portland! Good night moon! Good night lamp! 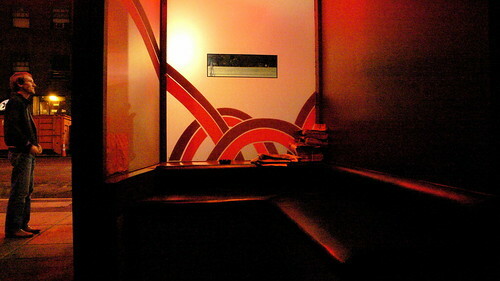 Good night keitai! Good night Ultraman!